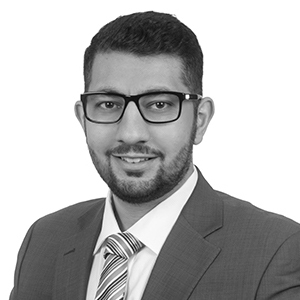 Ahmad joined Al Tamimi & Company in January 2019 as a new Associate with the Corporate Commercial Department in Kuwait. Prior to joining, Ahmad practiced law in Ohio, United States, and also taught business law as an Adjunct Professor at a local college in his area. Ahmad’s practice focused on research and drafting, whether for clients or for lawyers around the country, who often engaged Ahmad to assist with drafting memoranda and various legal documents. He was actively involved in his local bar association and was a guest speaker before hundreds at numerous local events. Since joining Al Tamimi, Ahmad has become involved in numerous acquisitions and other matters. He advises clients on a variety of commercial matters. Further, he recently joined the firm’s innovation committee, which focuses on helping to continuously improve the firm’s efficiency and technological development. Advised one of the biggest private investors in the petrochemicals sector in Kuwait on a broad range of commercial matters, including mergers & acquisitions and corporate governance. Advised a publicly listed investment company on a multi-million dinar acquisition. Drafted and negotiated NDA’s on behalf of a seller. Drafted commercial brokerage agreements for purchase and sale of shares. Advised numerous clients regarding agency agreements and other related matters. Advised an employer in a construction contract with regard to contractor’s assignment of rights.